Secretary of State Mike Pompeo’s announcement on February 1 that the United States is suspending the Intermediate-Range Nuclear Forces treaty, or INF, should worry everyone. The INF is a landmark treaty and it has made the world a safe place. It was the first nuclear agreement to ever outlaw an entire class of weapons. The Trump administration has dismissed the INF as irrelevant because Russia has abrogated its commitment to it by developing a treaty-busting cruise missile of its own. The Russians, for their part, claim that it is the United States that started this race to the bottom by announcing its withdrawal from the Anti-Ballistic Missile treaty in 2001 and building missile defence systems near Russia’s borders. Regardless, it should be kept in place. 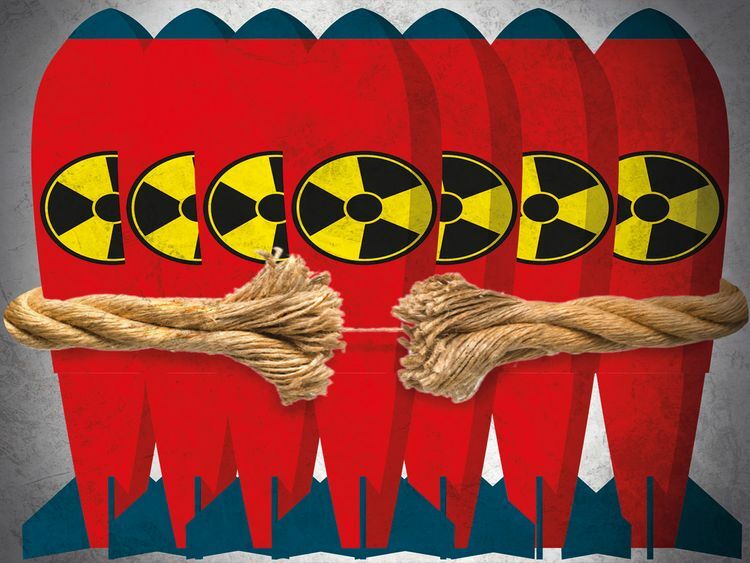 Major nuclear powers are now investing heavily in their arsenals. The United States plans to spend more than $1.2 trillion (Dh4.4 trillion) over the next 30 years on the targeting and kill capability of strategic nuclear weapons; China, too, continues to modernise its nuclear forces. To make matters worse, there are few channels of communication between adversaries — particularly the United States and Russia, which maintain more than 90 per cent of the world’s nuclear weapons. There is also a revived belief that nuclear weapons could be used. Russia’s military doctrine is increasingly reliant on them. Congress has an important role to play. Adam Smith, the new chairman of the House Armed Services Committee, that the Trump administration’s nuclear spending plans are neither necessary for deterrence nor affordable. His committee will have sway over which defence systems get funded and which do not. He can slow significantly plans to deploy these new weapons. The new Democratic majority in the House can and should hold hearings on whether conventional weapons offer a similarly strategic substitute for nuclear weapons, while creating greater flexibility in how they can be used. Many experts, such as former Secretary of Defence William Perry, believe that a conventional response would be as effective if not more so. Certainly, America’s decision-makers owe their country the debate before spending large amounts and unnecessarily contributing to a new arms race. The Trump administration should also take up Russia’s offer to start negotiations about the extensions of the New Start arms control agreement, which is set to expire in 2021. Upon taking office, the administration dismissed this offer almost immediately. Indeed, there’s good reason to be sceptical of it. But avoiding talks provides Russia with an easy propaganda win and allows it to continue violating its few remaining treaty obligations. For its part, Moscow should send serious negotiators to the talks — and not political officials with no decision-making abilities, as it has in the past. Congress can help find ways to restart talks between the United States and Russia, including military-to-military ones, focused narrowly on nuclear weapons. Such talks were common during the Cold War but are largely absent today. They should be resumed now, as nuclear accidents and misperceptions become more likely. The two sides have a shared interest in protecting the future of humanity. But such dialogue is made harder as President Donald Trump struggles with accusations of undisclosed ties to Moscow. Dialogue with Russia would be a juicy target for Democrats to use against Republicans, in the short-term sport of election politics. Restraint will be needed. All players — on all sides, Republican and Democrat, American and Russian — need to act like sensible grown-ups when it comes to nuclear security. The world has entered a dangerous new era of instability. The Trump administration’s actions, like building smaller-yield nuclear weapons and pulling out of arms control agreements, are only making it worse. Rachel Bronson is the chief executive and president of the Bulletin of the Atomic Scientists.